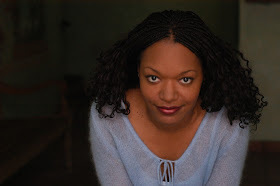 San Francisco native and Supernatural defender Denise Tapscott has a degree in TV/Radio Broadcasting from San Francisco State University. 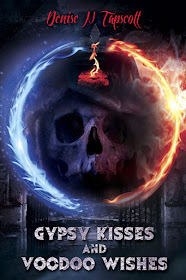 She is the author of Gypsy Kisses and Voodoo Wishes, described as a "southern gothic, paranormal dark fiction novel" part of a triology series titled the Zenobia Tales. This fellow left-hander is also an actress, taking supporting roles like the web series The Vamps Next Door and certainly someone to keep an eye out for on future screens. While currently working on a short story titled "The Price Of Salvation", Denise wanted a moment to talk about how travelling helps with writing, world building, and why zombie narratives are relentlessly evergreen. Do you watch horror films and/or TV series with your eye on characters who are non-white and non-cishet male? What kinds of trends have you noticed since you first began watching scary movies? What do you enjoy about representation of different types of people in horror texts and what don’t you like? I do specifically pay special attention to non-white and non-chishet male characters that appear when I watch horror/thriller films and TV series. When I was younger, it seemed like other than Blacula, there were no people of color at all in that genre. One of my favorite movies is Rosemary’s Baby (1968). Great story, but there is not a single person of color, male or female present. As the years passed by, I’d notice more projects that featured more people of color, but to my disappointment those characters were usually male and would be one of the first to get killed off, or in a few cases (like The Shining or Night of the Living Dead) they were the last to get killed off. I also noticed in some cases the person of color was the comedic relief, which I didn’t find funny at all. As a woman, and a person of color, I’d find myself saying, “Well, obviously that would never happen to me” when watching a horror movie. There was always a slight disconnect. Sure the stories are fictional, but not seeing someone you could relate to adds even more distance. I remember being excited to watch Wesley Snipes in Blade. He was a cool, black vampire and it wasn’t a comedy! Nowadays there are lots of projects on television and in film where the casts are more diverse. One of my all-time favorite television shows is Supernatural. At first I refused to watch some show about two white guys, in a cool car, chasing monsters. After I briefly met one of the stars of the show, Jared Padalecki (who is a great guy) I decided to watch an episode or two. In the first season, there was an episode about a mysterious ghost truck that was killing people, and the story dealt with the subject of racism in the south. Sam and Dean came to help a strong, black woman. Spoiler alert, she wasn’t comedic relief, and she didn’t die at the end! After watching it, I was hooked on the show forever. The main characters are still white, and male, riding around in a cool car, but in almost every story there are lots of people of color and they don’t succumb to the usual stereotypes I’m accustomed to seeing. Female, and ethnic people are monsters and heroes, angels and demons, victims and survivors. I love it! I hope more TV shows and movies take note. There are more non-white and non-cishet male horror fans out in the world than people expect, and we want to see our reflections in this genre too. So you “love to hate” zombies. Tell me about your experience with this iconic figure of horror/sci-fi/fantasy that made you come to this conclusion. The first movie that scared me so much that I had nightmares for about a week, was Night of the Living Dead (1968). I watched it in the 1990’s on a bright sunny Saturday afternoon and yet, this old black and white movie frightened me. To this day it still creeps me out. The idea that dead humans could pop up out of nowhere and try to eat me was, and still is, terrifying. As a writer (and a fan of horror) I love that no one is safe from these villainous creatures. In most zombie stories, there is no trick to killing a zombie, other than aiming for the head. If you aren’t great with weapons, you will not survive a zombie attack. There is no cure if you or a loved one is bit by a zombie other than maybe, possibly amputation? What would you do if you knew and loved the human that turned into a murderous zombie that growled as it tried to eat your face? In other horror stories, most monsters can be killed or characters can find solid ways to protect themselves. The hero needs to find the monsters weakness. They can get a cool weapon or save them self with something like a holy water, silver bullets, or a cross. Maybe they just need to survive long enough for the sun to come out. If the monster is human, such as a serial killer or psychopath, supposedly law enforcement could help. But zombies? Forget it. In every film and TV show that has them, you, the hero, are pretty much on your own. Zombies don’t care if you are male or female, rich or poor. It doesn’t matter who you are; “They’re coming to get you, Barbara.” They don’t have a favorite flavor when it comes to human flesh. If there are hundreds of them coming after you, may God have mercy on your soul. Have you seen the aggressive zombies in 28 Weeks Later? They freak me out every time I watch that film. Zombies make my skin crawl, and my heart race because no one is safe from them. No one can really protect you from them including Alice, in all of the Resident Evil movies. If I were a character on The Walking Dead, I would always stick annoyingly close to Michonne and Rick and even then, my character wouldn’t be 100% safe. Zombies are relentless. Zombies are great to hate. When you describe your soul to be in New Orleans, are you referencing your Zenobia Tales series? Tell us more about it and how the southern gothic theme has inspired this story. The first time I visited New Orleans, I was twelve years old. My family and I spent our summer vacation driving across country from California to visit relatives on the east coast, and back. We stopped for a few hours and spent time in the French Quarter before heading down the road. I have vivid memories of my younger sister and I eating a pile of powdered sugar coated beignets at Cafe Du Monde. I also remember walking into Madame Laveau’s House of Voodoo and staring in awe at all the cool things they had on display, like strange roots in jars, and African masks. We were only in the shop for a few moments when my God fearing parents whisked us out before we could get into any spiritual danger. There was an eerie but strangely comfortable feeling I got standing in that store. As an adult, I have been back to New Orleans, many times since then, and the instant I step off a plane and breathe in the air, a peculiar magical feeling stirs within me. For some reason, New Orleans, with the highs and lows of her culture haunt me. Southern gothic stories always grab my attention. I like the mix of supernatural, romance and dark delusions that southern gothic tales have. Angel Heart and Skeleton Key are on my list of favorite horror films. When the idea for Gypsy Kisses and Voodoo Wishes came to me, Grandmother Zenobia was originally a minor character. The bulk of the story was going to take place somewhere else, and was going to take place modern day. When I began to flesh out all the characters in my story, she really stood out. My beta readers wanted to know more about the Voodoo Woman. When I gave Zenobia my full attention, the story shifted. I travelled a few times back to New Orleans for more research. The story needed to be in a fictitious parish in Louisiana. I wanted readers to experience the unusual, off kilter feeling you get in southern gothic stories, especially when they were introduced to Grandmother Zenobia. On one hand she’s intimidating and overbearing like the French Quarter can be. Fun but potentially dangerous if you didn’t pay enough attention to your surroundings. Hopefully readers also find her older and creepy but also endearing and sweet, like the Garden District. My goal for the entire book was for it to be tragically beautiful with decadent, treacherous moments. Just like the city of New Orleans as a whole, I wanted to make sure the book had many elements, like a pot of gumbo. 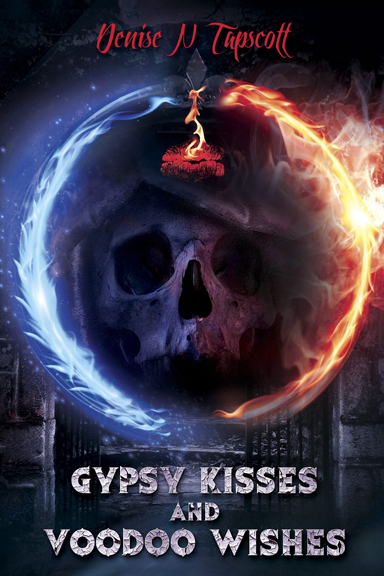 Gypsy Kisses and Voodoo Wishes along with the other books to follow should be like a delicious meal that that’s so tasty you have no choice but to eat to the pain. You’ve jokingly described yourself as over 200 years old. Do you consider yourself an “old soul” and if you do, what are your feelings on the less than pleasant ideas of being considered one and how do you think this informs the horror genre as a whole; exploring the idea of the outsider? Because of my playful nature, I don’t consider myself an old soul, but I do feel as though I’ve been around for a very, very long time. For example, just the other day I mentioned to someone younger than me how much I love Cary Grant, especially in Hitchcock movies. They looked at me as if I spoke a different language. How could they not know Cary? This generation of people doesn’t know what they’re missing! Then I thought, I imagine its how an immortal would feel. I’m not old as in “get of my lawn, hooligans” but I’ve been around long enough to see trends repeat themselves. When I was little, afros were in. Now, decades later, afros are back in! I don’t look my chronological age (many people of color don’t) and I don’t have the aches and pains of someone "older" (at least not yet). If I do tell someone my actual age, they almost never believe me. I get the same reactions, especially the look of disbelief, when I tell people that I love horror. Some cringe or roll their eyes as if I told them a bad joke. Being a person who writes horror/supernatural stuff and who loves to read horror/supernatural stuff, I feel I’m always on the outside, especially when it comes to the literary world. It’s as if the ‘gatekeepers’ of what gets published don’t want to take us, those who like horror in its many forms, seriously unless you’re a big name like Stephen King. It’s even harder to be taken seriously as a black woman who’s a fan of horror. People of color have been around, for a long, long time, with awesome stories to tell and more often than not, we are on the outside of society looking in. On the other hand, being the optimist that I am, it’s cool to be the outsider, the rebel, a part of the ones who think outside of the box. The rest of them will catch up to us eventually. What is it about the genre of horror that appeals to you and how do you want to use your work as an actress, writer, and all around creative to inspire others who may feel hesitant about embracing the genre because of negative perceptions of it? One of the great things about horror is that I get to escape reality for a little while, one twisted tale at a time. The horrors of real life are treacherous, especially when you start to mull over what’s going on with the world at a political level. Sometimes it makes me feel helpless. In the world of fiction? You have power. As a fan of scary things, I love that stories can push boundaries, but in the end, you, the reader, get to live another day. If something is too disturbing, you can simply walk away unscathed. As a writer, it’s your universe to play with. You can make up anything you want, and if told properly you can make people’s hearts race, or break, or soar. Sometimes people are hesitant to embrace horror as if it’s a portal that will drag your soul to hell. People’s first impression of me is that my life is filled with sunshine and lollipops and when I share with them how I love horror, they are very surprised. When they see how passionate I am about some story, they are drawn in. Sometimes they will mention a scary movie that they really enjoyed, it sparks great conversation. Then we all get to share and connect on a certain level, which I love. Horror will not make their lives a living hell, if they are selective about what they want to read or watch. Negative perceptions will always be around; it’s a part of life. There will always be someone that doesn’t like what you create or worse, they want to make you feel bad for what you created. On the other side of that coin is that there will always be someone that loves what you create and they want more. I will always I do my best to encourage anyone who is brave enough to share their creativity with the world. If it’s horror and you are a person of color, I will try even harder to support your work if I can. The genre has many different sub-categories, which means there are tons of stories to be told. They are my tribe, supporting them is the least I can do. Learn more about Denise on authorsinterviews and Gwendolyn Kiste.